I was recently reading an article called Eggs for Dinner in the February issue of Self magazine about how eggs can help you lose weight/feel amazing… so I naturally decided to make something particularly decadent and fattening for this post. 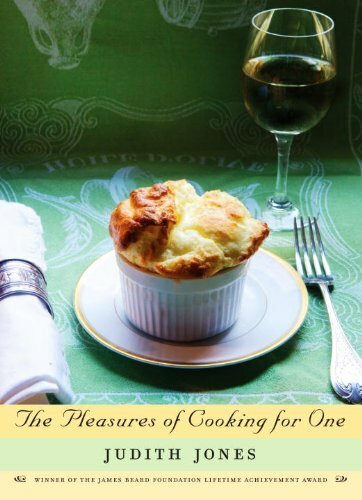 Judith Jones wrote a fantastic cookbook called The Pleasures of Cooking for One, which details how to make single servings of the most delicious and delightful dishes from boeuf borguignon to bread pudding. Judith Jones is a senior editor at Knopf, and is responsible for publishing notable cookbook-writers such as Julia Child (Judith published Julia’s first book and was her editor ever since), James Beard, Marion Cunningham and Marcella Hazan. 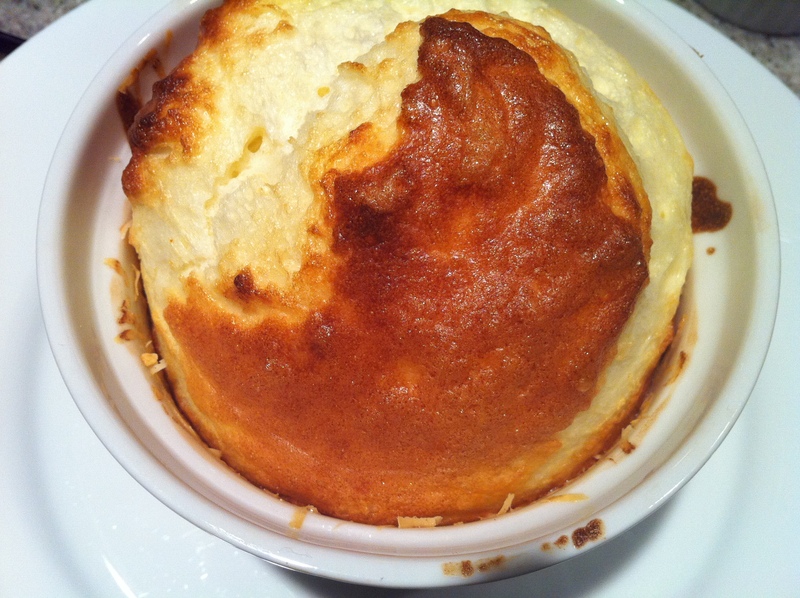 The item displayed proudly on the cover of Jones’s book is her cheese soufflé for one which I simply had to recreate. Thouroughly butter a 4″ soufflé dish, and then coat the sides with the grated parmesan. Over medium-low heat, melt the remaining 2tbsp of butter and add the flour. Let it cook for about a minute and then remove it from the heat. Add the milk and whisk thoroughly to combine – place the pot back over the heat and stir until it thickens. Add the salt and paprika, remove from the heat, and stir in the egg yolk. In a seperate bowl, beat the egg whites (I used my handy-dandy Viking hand blender) until they form soft peaks. 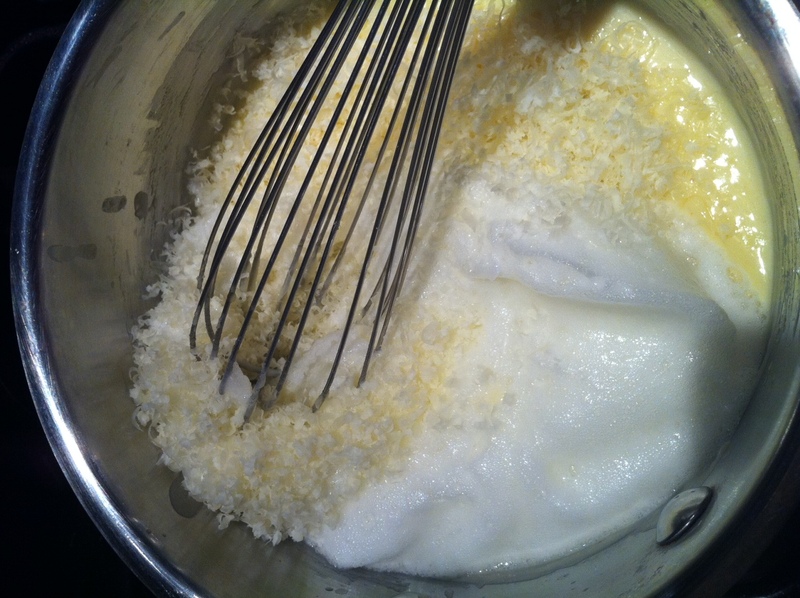 Add a dollop of the egg whites to the pot, and about half of the grated cheese (I used a cheddar/gruyere combo). Then add the remaining egg whites and cheese. Pour the mixture into the soufflé dish, turn the oven down to 375, and bake for 18 minutes or until it is puffed and golden brown. It is so light and fluffy – like eating a cheese-infused cloud. This entry was posted in Eggs and tagged butter, cheddar, eggs, gruyere, Judith Jones, milk, parmesan, souffle. Bookmark the permalink.